The most obvious change is the motor, which for the first time in its 90-year history has gained liquid cooling. Sort of. Where the old Boxer engine was 22 per cent oil-cooled, 78 per cent air-cooled, the new motor is 35 per cent liquid-cooled and 65 per cent air-cooled. BMW calls it 'precision cooling'; effectively targeted water cooling in high thermal stress areas. Internally the motor is also redesigned with a lighter crank, slipper clutch, vertical through-flow (the intake and exhaust are top to bottom on the cylinder rather than forward to back as before) and ride-by-wire electronics for the first time. The chassis is also new with the swingarm redesigned and the single-sided hub moved to the other side of the bike along with the exhaust. BMW says as well as making wheel changes easier, this also means that when you push the bike you don't lean against the pipe as generally people push from the left. 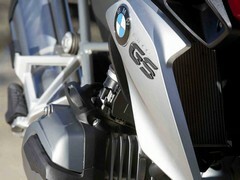 The electronics package is improved and, like the HP4 sports bike, the GS gains semi-active suspension (Dynamic ESA). As well as cruise control, the GS's traction control and ABS are linked and alter their performance according to which of the new four fuel modes are selected. There are other new touches such as LED lights and a new look, but these are just a few of the highlights. Despite being something of an old stag, the 2012 GS still held off young bucks like the Triumph Explorerand Honda Crosstourer. The new pretenders basically looked at the GS and copied its ideas, Triumph as good as admitting as such. Only the Explorer really managed to get anywhere near and even then the BMW still outsold it in the UK. 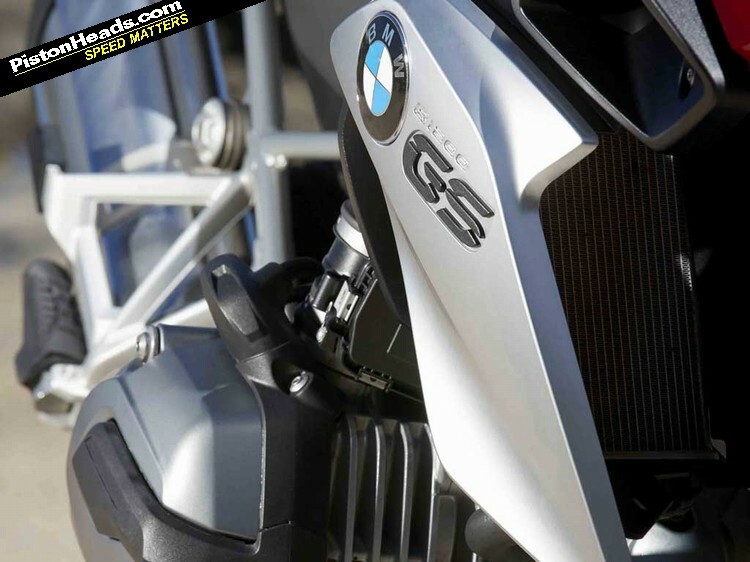 Now the job has become even harder as the new GS is everything the old bike was - just better in every single aspect. When you blip the throttle the new engine only has a very slight 'BMW lurch' - the rocking movement caused by the crank spinning - and also feels and sounds far quicker revving. It's as if a load of weight had been shed from the internal components and the bike suddenly feels more eager to respond. Pull the extremely light clutch in and with a click from the much improved gearbox you are away, which is where the new GS will truly impress. The big question current GS owners will want answering will be 'is it worth trading up?' Yes it is. The new engine feels and responds with the same sound and torque as the old bike, however it does it with much more urgency and a sharper throttle response. However, when you don't want to accelerate it is smoother than the old motor at constant revs and the gearbox is infinitely better. Of the four fuel modes (Rain, Road, Dynamic and Enduro) I found Road and Dynamic the most useful. In Rain the throttle response is pretty muted, Road and Dynamic far better. With the BMW traction control system (which is excellent) these two modes work whatever the weather. In the bad old days of big trailies the combination of unusual wheel sizes (generally 17-inch rear, 19-inch front) and pretend off-road tyres made for vague handling. 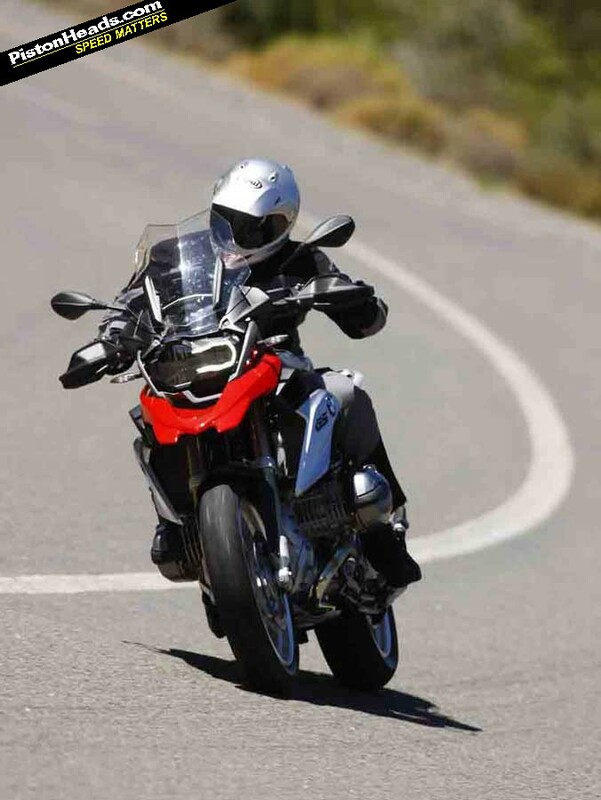 Bikes such as the Tiger and Multistrada changed this by using 17-inch wheels but BMW has always stuck with the 17/19-inch combination. Modern tyres have improved the feel, but I still had my reservations about these sizes. I don't much like the feel and would rather have 17-inch wheels and proper rubber. Saying that BMW has equipped the new GS with wider wheels and tyres (120/70 from 110/80 on the front and 170/60 from 150/70 on the rear) as well as new Metzeler Tourance tyres. 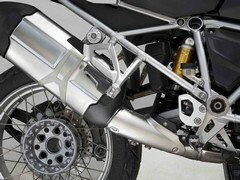 This move, along with the altered chassis and longer swingarm, has transformed the GS's handling. It now corners with the kind of stability that I never expected from these wheel sizes. It is a remarkable transformation, and one that may be due in part to the new semi-active suspension. A successful electronic system is one that's so unobtrusive you don't notice it's there, BMW ABS (especially on the S1000RR) a case in point. The Dynamic ESA (electronic suspension) works like this. While it has the same settings as the old ESA (soft, normal, hard) the semi-active side just gets on with the job in hand and sorts the rest out. Without riding a non semi-active GS back to back I honestly couldn't say how effective it is on the road, but on some gravel tracks it was remarkable. 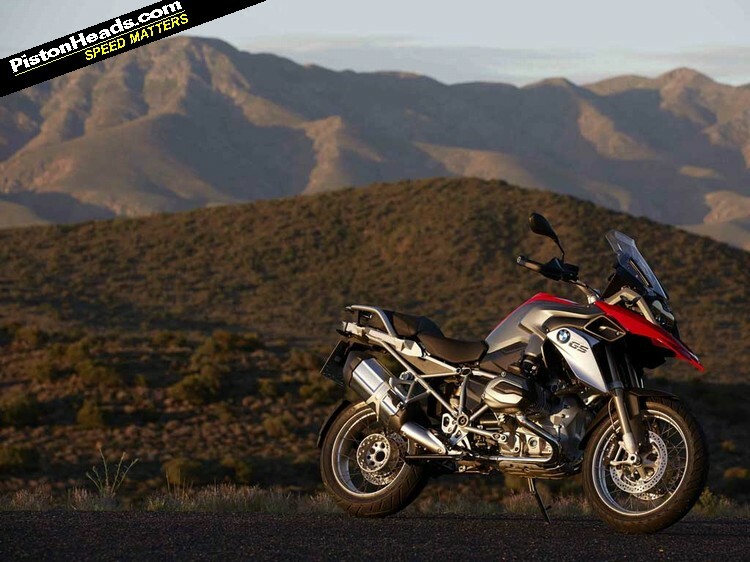 The 2012 BMW R1200GS is a fantastic machine with a thoroughly deserved reputation, the 2013 bike takes this based an improves on it by adding a giant leap forward when it comes to technology and handling. 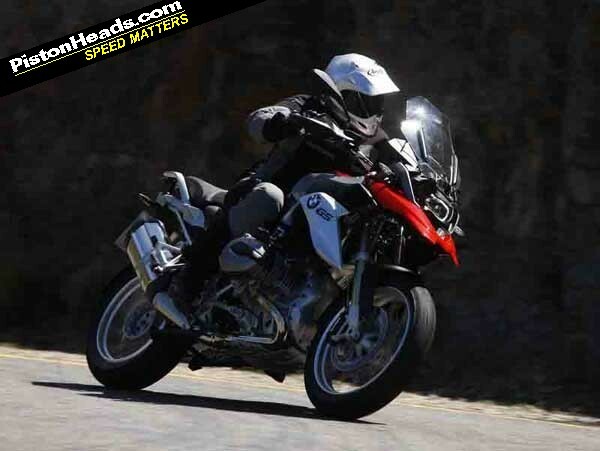 There was a danger that by increasing power and torque BMW may have lost the GS ethos and character but it hasn't. Owners of the air/oil cooled model shouldn't despair but the (partly) liquid-cooled GS is the future and will dominate group tests and sales charts for years to come. The new KTM 1190 Adventure will probably be a better off-road bike and will have a splash of KTM's character, but I'm sure the GS will still remain the choice of the majority because it does everything so incredibly well. It's with great sadness that we report that whilst on this launch event Daily Telegraph motorcycle correspondent and experienced bike tester Kevin Ash was killed in an accident. A full obituary can be found here on the Telegraph's motoring website and Jon Urry's personal tribute can be found here. The PH team wishes to extend its condolences to his family and friends. 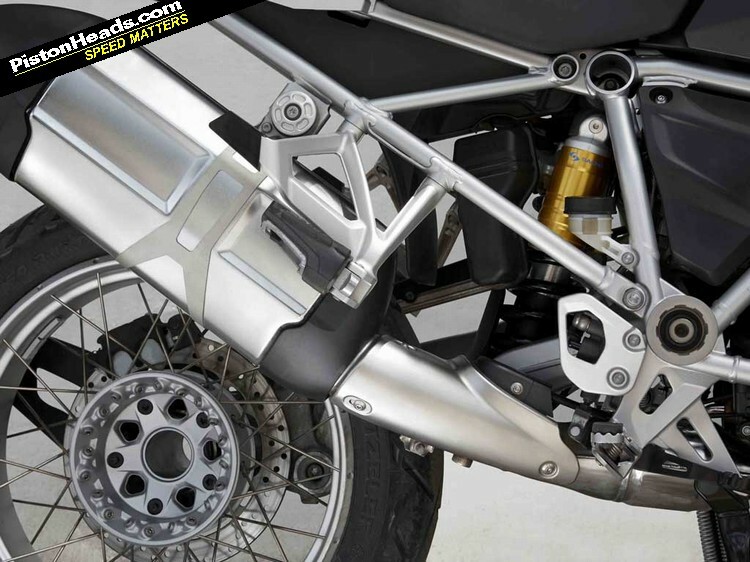 "With anything good electronic package the key to it being impressive is if you can't spot it is even there BMW ABS (especially on the S1000RR) a case in point. " Why are bike engines described as 'liquid cooled' and car engines 'water cooled'? Is it because the abreviation LC is prefarble to WC? There is SO much missing from this review! By stability, you mean they've ruined the feeling that the bike is alive underneath you and at its best being manhandled down fast B roads? By smooth, you mean the water cooling has attempted to hide the fact that it's actually an engine and it breathes burning hydrocarbons? By better, you mean it's been further sanitised and dumbed down for the masses? Or perhaps you don't mean any of that, it's just thats how your review comes across? I guess I'll have to grab a test ride and answer these questions myself. I had to read the last line twice. You haven't had a test ride and are assuming all that? Don't know why the stability of the older model was in question, with its front-end, the previous models stability in the corner and lack of dive was already remarkable. My '06 GSA is the most solid handling bike I've ever ridden. 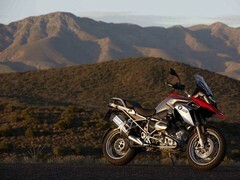 "Of the four fuel modes (Rain, Road, Dynamic and Enduro) I found Road and Dynamic the most useful. In Rain the throttle response is pretty muted, Road and Dynamic far better. With the BMW traction control system (which is excellent) these two modes work whatever the weather." … surely this is just stating the bleeding obvious, thats what the bl**dy system was designed for and the whole point of "RAIN" mode is to mute the throttle and stop sharp throttle action or spin-up potential.